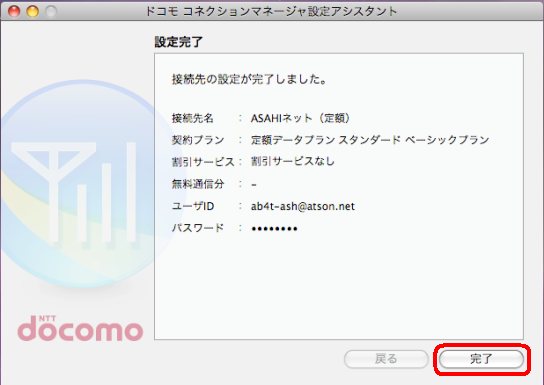 After you install the configuration file (driver) and Connection Manager software from NTT docomo's CD-ROM, please launch the Connection Manager software and configure it with your Asahi Net User Name and password. 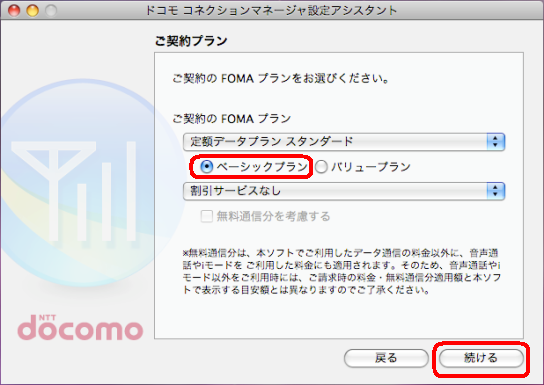 Make sure your FOMA High-Speed communication device is connected to your computer, then click the Tzudzukeru (continue) button. 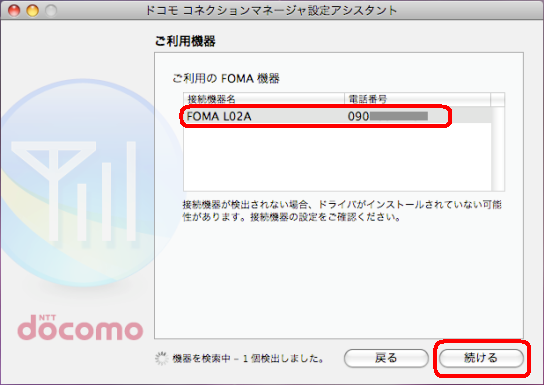 Confirm that your FOMA High-Speed communication device has been detected, then click the Tzudzukeru (continue) button. 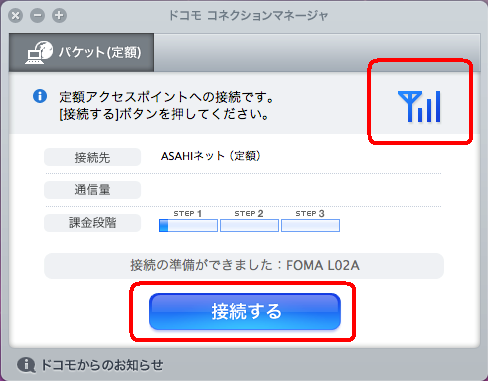 Click the Sono ta no Intaanetto saabisu probaida (Other Internet Provider) option, then click the Tzudzukeru (continue) button. Pasuwaado wo Kioku (Remember password) Arbitrary. Please note: Should you use a different APN it is possible for your connections to not be Flat-rate but instead be metered, resulting in high packet communication charges. Please make sure you are using the correct APN here. Then click the Tzudzukeru (continue) button. 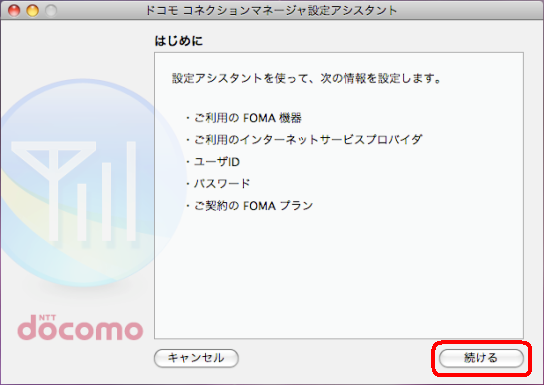 In the Go Keiyaku no FOMA Puran choose the Be-shikkupuran (Basic plan) button. The final page will display the settings that you have made. Click the Kanryo (Finish) button. The Denpa Joutai (Signal State) icon will allow you to confirm that there is a signal available with which to make a connection; if there is, click the Setsuzoku suru (Connect) button. 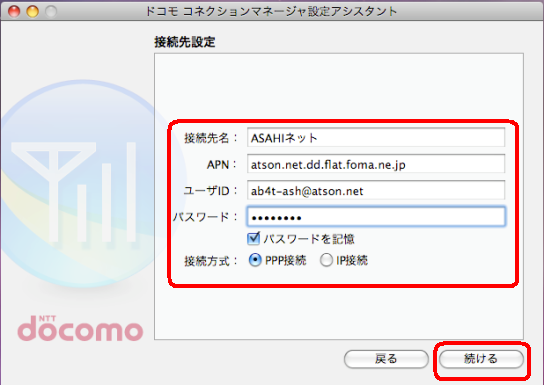 Thank you for visiting the [FOMA Mac OSX Configuration Guide : Asahi Net : Internet Software Guide] page of Asahi Net, the Internet provider.